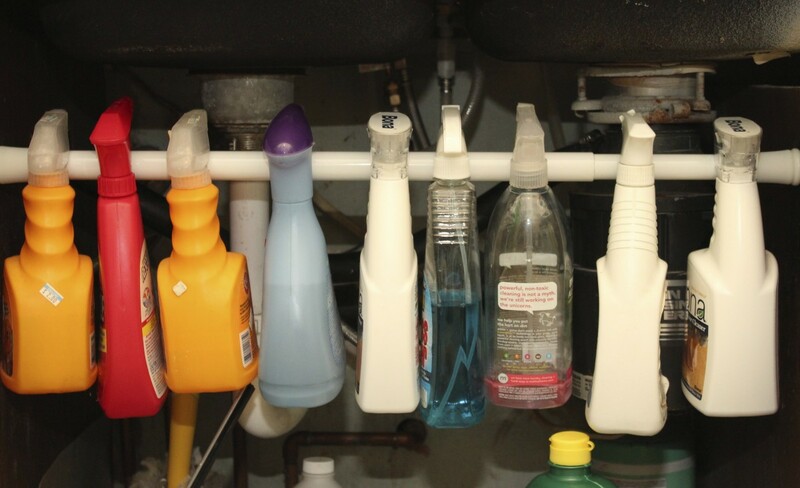 Here is a great way to keep all your cleaners organized under the sink. Buy a short shower curtain rod and install it under your sink, make sure it is in there tight. 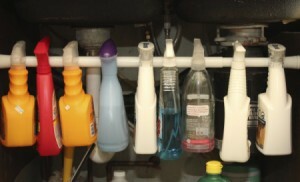 Then, place all of your cleaners that use a spray nozzle on to rod. This rod keeps all the cleaners up off the bottom of the cupboard, leaving room to for other things. 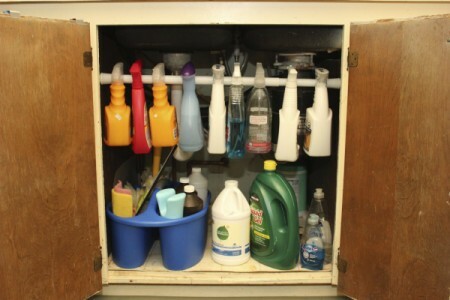 I have a cleaner caddy under there that I have all of my cleaning tools in, such as sponges, brushes, and steel wool. Note: I haven't had any trouble with the rod slipping down, but I thought that if I did start to have that problem I could fix it by buying the cups that hold the closet bar in place and use those to also hold the shower curtain rod in place. Fantastic idea. Thank you so much. I got a kick out of the bar I used a spring curtain rod. Keep the suggestions coming I enjoy this site. I love this idea, but cannot find a short curtain rod anywhere! Where did you find one? They seem to all come standard. "Help" Please let me know Where? What a wonderful idea. I was just looking under my sink wondering how to organize everything. Thanks for this idea.